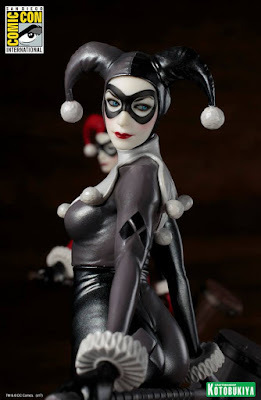 Kotobukiya has unveiled this beautiful San Diego Comic-Con 2017 Exclusive A Night In Gotham Edition Harley Quinn ARTFX+ Statue based on DC Comics' iconic Batman villain. This limited edition release features a silver and black color scheme with exclusive packaging made just for this SDCC release. This 1/10 scale PVC statue will be available for purchase at the Kotobukiya SDCC booth #2601 next month.